Perhaps the most important development in 20th Century Fareham, Eastern Way takes the A27 out of the town centre (or half of it at least - the other half is provided by Western Way). True pedants will be keen to point out that Eastern Way is actually shared between the A27 and the A32 throughout, and while that is correct, the A32 becomes almost marginalised around Fareham town centre, and barely gets a look in. The road was opened in 1971 and referred to in planning documents as the Fareham Southern Bypass or Eastern Link, its main purpose being to cut the corner between Gosport Road and Cams Hill. The original layout was a large roundabout which utilised the railway viaduct, this was then shifted northwards slightly when Western Way was added. At this point the buildings in the middle were knocked down and trees were planted, which were then removed in 2011. Subsequent roadworks have masked just how sharp the road turned in order to meet it at the roundabout. In June 1986, a southbound filter lane and the strange single lane flyover were built in an attempt to take the pressure off the roundabout, requiring a building to be knocked down. At the time this opened, the official press release acknowledged that the flyover was a budgeted solution which would not solve all the problems, and that eventually the junction would have to be redesigned again - ideally when the Portland Street area was demolished. The project cost £1.5m. Eastern Way westbound was widened at the same time, despite being only 10 years old, a clear sign that the scale of the Gosport problem had been under-estimated. Before it was built the roundabout was much bigger, and ran under the railway arches and around a yard. Obviously the advice on replacing the flyover fell on death ears, but in truth the problem never was getting to or from the station. The flyover was part of a package of improvements which were all about trying to make it easier to get out of Gosport, which is where the majority of traffic was (and still is) coming from. Having cleared the vortex that is the Quay Street Roundabout, the dual carriageway heads east through what was mostly privately-owned fields, before crossing Bath Lane, demolishing about eight houses in the process. Splitting up Bath Lane meant that alternative access was needed for what became Lower Bath Lane, and this was provided via one of Eastern Way's new sliproads, using reclaimed land. From the Bath Lane subway (where a precarious footpath joins us), more gardens were taken up, although four properties (located on The Esplanade, the predecessor to Deanes Park Road) were lost at the Delme junction. 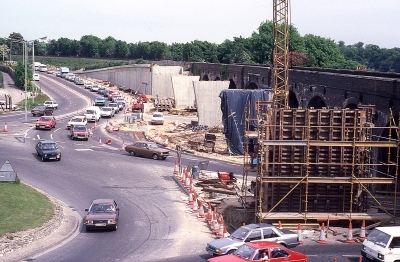 The Delme flyover was retrofitted in June 1985, at a cost of £2.8m. It is a 140m long, three-span, post-tensioned concrete bridge. Before it, the two carriageways simply pulled apart, and dropped down steeply to form the sliproads. It was another one in the Gosport improvements package. Eastern Way is only short, and it ends here, but since we're here and the next road has no name we might as well continue. 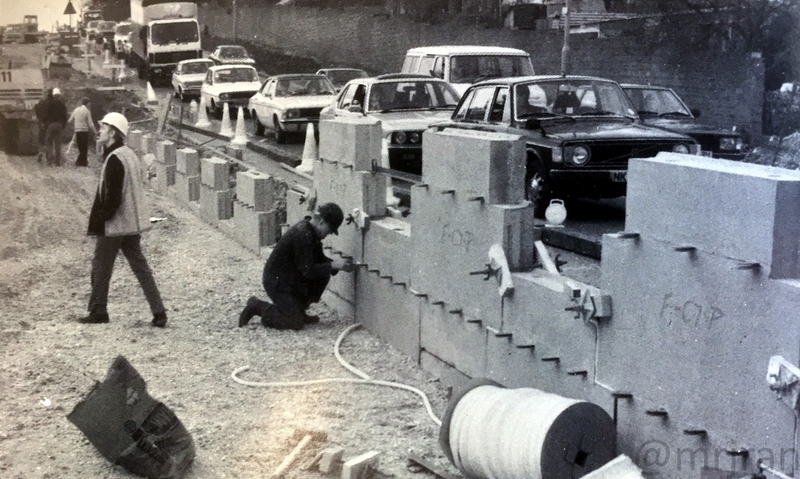 The road up to J11 was opened in 1976 as part of the motorway contract, which is reflected in its better build standard. From the flyover, it climbs steeply up the hill on which Fort Wallington was built, as a result of this, the sliproads are extraordinarily long as they struggle to rise up to the road and make the climb at the same time. It cuts across the path of Pinks Hill, which means it now meets Pinks Hill at a lax angle that lends itself to many wrong-way accidents. Pinks Hill used to be the name of the hill, while the street formed part of Wallington Military Road. The first map with it on as a street is dated 1898. With the opening of the Fort Wallington Industrial Estate, a campaign from local residents saw Pinks Hill turned into the main access route. Eastern Way continues to rise and curves north, carving up the main Military Road (a privately owned link between the forts) in the process. Coupled with the M27, one section of Military Road is now only accessible locally via Paradise Lane, as it has been isolated. By the time it reaches the roundabout known as the Wallington Interchange, the road is at a considerable height above the M27, leaving the motorway in a deep cutting, spoil from which was used to build J12 and the M275, which both encroach on seawater. The size of the cutting which the roundabout is built on is phenomenal: you can't really appreciate it under all the trees which have been planted, but instead you have to look at the top of the hill and imagine it continuing across. This seems like an appropriate place to discuss the route of Fareham's bypass, which J11 owes its very existence to. 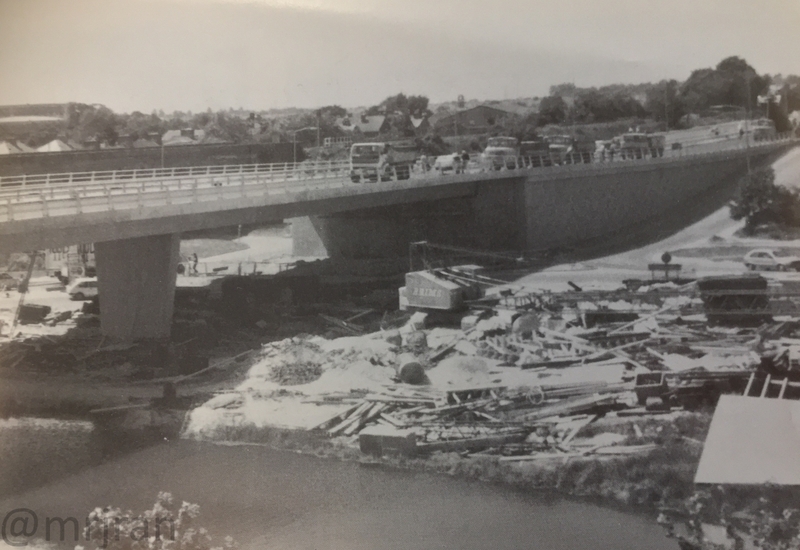 As construction started on other parts of the proposed South Coast Trunk Road (maiden name for what become the M27 Southampton - Chichester motorway), ideas were still torn for the route around Fareham. Gosport Council had heard of a route running north of Titchfield and Stubbington, south of Hoeford, and then south of Portchester along the coastline and over the mud flats, and wanted this to alleviate their traffic problems. Portsmouth City Council wanted most of that route, but suggested it go around Portchester to the north instead. Fareham Urban District Council were happy with the chosen route north of the town (albeit only just - when it came to voting on its position, it won 13-8), and Hampshire were firmly in favour of the northern route. The drawn swords over the two routes hindered the project, and an independent study began by stopping motorists on the existing A27 and asking them where they were going. The study concluded that while the southern route would be better for traffic, it wouldn't justify the extra millions (the exact figure was £1m extra, plus any engineering difficulties considering the route, and any compensation paid to the shipping industry as some of Portsmouth Harbour would have been cut off), and both plans would require Gosport Road to be tripled in width for it to actually help Gosport. The study suggested the best solution would be the northern (chosen) route, and to build a bridge between Gosport and Portsmouth. This was much relief to people in Portchester, who feared the southern route would have carved their village. The new route was then protected, and only portacabins were allowed to be built on it, while Paulsgrove was developed around it.